This past weekend, I went to the NBC4 Health and Fitness Expo for this article. 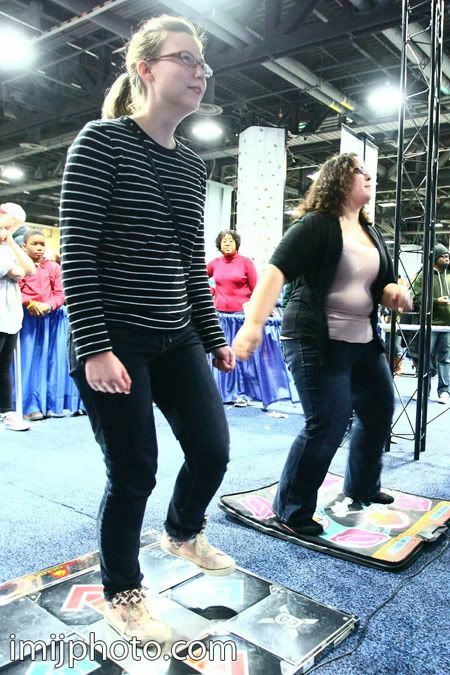 Tons of people and exhibitors, and in our travels, we walked by the Dance Dance Revolution booth. "Look at that," said Tony the photographer. "Oh, DDR?" I said. He didn't recognize the acronym. I thought that was just common knowledge. Joe and our friend Alex C. didn't know what DDR was either when I was recounting this story. I continued calling it that, despite their protestations, because I am just too cool for school. I suggested that Tony take my picture while I tried my hand at DDR, but just as a joke. Well, he took me seriously. I tried to demur, by saying that I am really terrible at this game. No, really. Really. 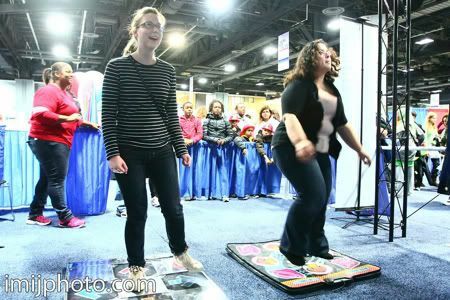 I ended up trying it, in front of a long line of DDR-crazed tweens. The results were not pretty. I have a very "Durrrr" expression on my face. And my feet are barely moving. OK, one foot got off the floor in this photo. So the whole 40 seconds I played, I don't think I even hit the foot pad successfully once. I am a horrible dancer, and seem to be incapable of getting my brain to direct my feet to move in a timely manner. The screen kept saying "boo, boo" and I'm sure the tweens watching were about to start yelling that as well. I slunk away and Tony said, "Wow, you weren't kidding when you said you were terrible, huh?" "Maybe if you practice all year, really work at it, you can come back next year and show them." January 18, 2012 by Adele Chapin.